From skiing in the Winter Olympics to hosting one of the most famous winter sports programmes in the country, Graham Bell is a former professional skier turned television personality. His love of the sport came from an early age, spending time in Scotland on dry slopes. From here he went on to represent Britain at many major events, including the Olympics , during the 1980s and 90s. Representing Great Britain at five Winter Olympics he competed alongside some of the sport’s biggest ever stars. 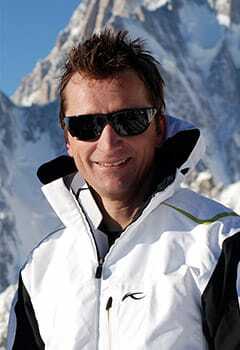 Graham retired from the sport in 1998 and has gone on to have an extremely successful broadcasting career, including presenting Ski Sunday on the BBC . If you would like to book Graham Bell for a whole range of opportunities, get in touch with Champions Celebrity Talent Agency by calling 0203 958 0389 or email talent.agent@championsukplc.com. 1984 – Wins silver medal at the World Junior Ski Championships . 1984 – Makes his Winter Olympic debut. 1998 – Retires from professional skiing. 2000 – Joins Ski Sunday as a presenter. 2002 – Ski Sunday wins ‘ Royal Television Society ’ award. 2006 – Commentates on Winter Olympics in Torino. 2014 – Becomes a mentor on The Jump . 2018 – Continues his work as both a commentator and television presenter. Skiing has a reputation for being one of the toughest sports in the world to master, but one man who is no stranger to navigating the slippery slopes, is former British winter Olympian, Graham Bell. He was just five years old when he put on his first pair of skis, practicing on dry slopes in Scotland, and he’s been hooked ever since. Alongside his brother Martin, Graham lived and breathed the sport, and it wasn’t long until the pair were representing their country at the highest possible level. He won a silver medal at the World Junior Ski Championships in 1984, the same year that saw him make his Winter Olympic debut at the Games in Sarajevo. This was the first of five Winter Olympic appearances for Graham, as he made a name for himself in the sport and he went on to compete in Calgary, Albertville, Lillehammer and Nagano. In 1998, after over a decade at the top he retired from the sport. His reputation as one of Britain’s greatest ever skiers meant he was in high demand and he was presented with a whole host of opportunities. Graham opted to make a move into broadcasting, commentating on the sport’s biggest events including the World Cup Ski Circuit . From here he moved onto Ski Sunday , presenting the show alongside winter sports host, Ed Leigh. During his time hosting the show, Graham has helped it to a ‘ Royal Television Society ’ award in 2002. 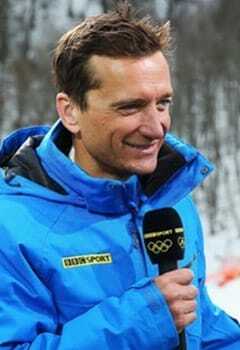 He has also continued his commentary work, working at numerous Winter Olympics. In 2014, it was announced that he would be taking on a role as a mentor on the series, The Jump . Here, he offered advice and guidance to the celebrity contestants who were taking on winter sports for the first time. Away from the slopes, and Graham has also featured on numerous television programmes including: The Gadget Show , Through the Keyhole and Pointless . Always keen to inspire the next generation of skiers, he also has worked as the International Performance Director for the Ski & Snowboard Federation . Graham Bell is well-known for his success in the sporting world and these achievements have made him perfect for a wide range of brand opportunities. An internationally recognised figure, he always conducts himself with the utmost professionalism, and provides a boost to every campaign he works with. The list of brands that he has worked alongside includes Heat Holders , Decathlon , Jaguar Land Rover , Garmin and Boile . With over 33K followers on Twitter , Graham is able to provide every brand he works with, access to a significant number of users. If you would like to book Graham Bell for brand endorsements, ambassadorial roles, media work, speaking opportunities or public appearances, get in touch with Champions Celebrity Talent Agency. Call us on 0203 958 0389 or email talent.agent@championsukplc.com.